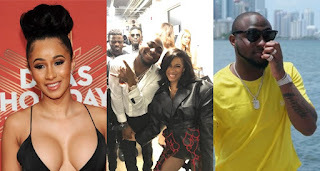 After Nigerian singer, Davido took to social media to share a backstage photo of himself posing with American rapper, Cardi B at the MOBO awards in London. Davido, via Twitter described himself as her number 1 fan after he shared a picture with her. 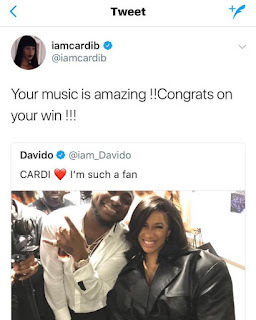 Cardi B replied – also describing his music as amazing and congratulated him on winning the best African act award. Your music is amazing!!! Congrats on your win!! !